108 W. Locust St. 11AM-9PM Tues.-Thurs. Fairbury, Illinois 61739 11AM-10PM Fri.-Sat. 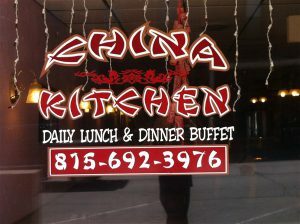 The China Kitchen – located at 108 W. Locust Street (Main Street next to the Video/Tanning facility) in Fairbury is a customized dining establishment that brings the culinary arts of Mandarin Cooking to our community in a convenient buffet style that offers a variety of the Chinese culture’s ingredients and techniques for our dining enjoyment. Mandarin is actually a language term but, it is what us Westerners have identified to when referring to Chinese cooking so we’ll keep it there while we talk about a very nice diversification to the area’s many accommodating dining facilities. Wen Sheng (now affectionately known by his nickname, “Wilson”) started the restaurant in 2001. He and his family have worked industriously to prepare and serve the many oriental dishes that so many of us have come to enjoy over the ensuing years. The family’s kitchen expertise and their creative talents have done wonders with the likes of chicken, fish, shrimp, beef, mushrooms, pasta and veggies with a never ending supply of white rice and fried rice. Also, the specialties, the accompaniments, and the salads and desserts give us a line-up that seems to always fill the plates up long before we reach the end of the selections. They’ve got a bit of Westernized dishes in the mix as well that tend to successfully fill the needs of those picky eaters (like the kids) who just can’t expand their dining horizons, but the end result is that everyone in the group will usually find something to make a complete meal with. They also have the traditional sauces (watch that yellow one – a bit too much and your sinuses will drain whether they need to or not) as well as the egg rolls to dip into them with and all the standard libations are available to quench your thirst with. The China Kitchen has a bit of remodeling going on which will make things even better in a customer oriented way so come on up and enjoy a taste of the Orient for lunch or dinner – the food is great, it’s convenient, it’s hot (or cold) and ready to go, the service is efficient and friendly, and you can eat as much as you want all for a very economically compatible buffet price that is arranged for in-house dining or take out – you can’t go wrong. This theatre of Chinese cooking delights is available Tuesday through Thursday from 11am to 9pm and Friday and Saturday from 11am to 10pm, giving us a time window to fit just about any need. Come and get it (and remember, unless you have a really fortified tolerance, not too much of that yellow sauce on any one bite). For you regulars, you know what we’re talking about and, for you folks who just need a nudge to try something different here you go – nudge, nudge! See you there.